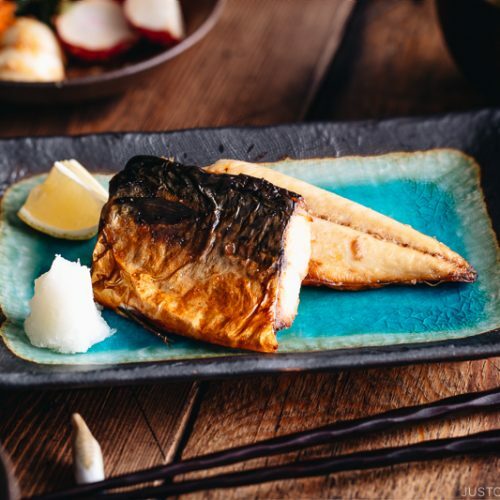 Baked in the oven, this Grilled Mackerel or Saba Shioyaki is the simplest fish recipe you can make on your busy weeknight. It’s a little rustic, but a thing of beauty, with its golden crispy skin and delicious flavor. 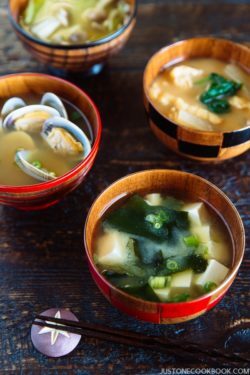 Serve it with steamed rice, miso soup, and a salad, you’ll have a lovely Japanese meal for dinner. 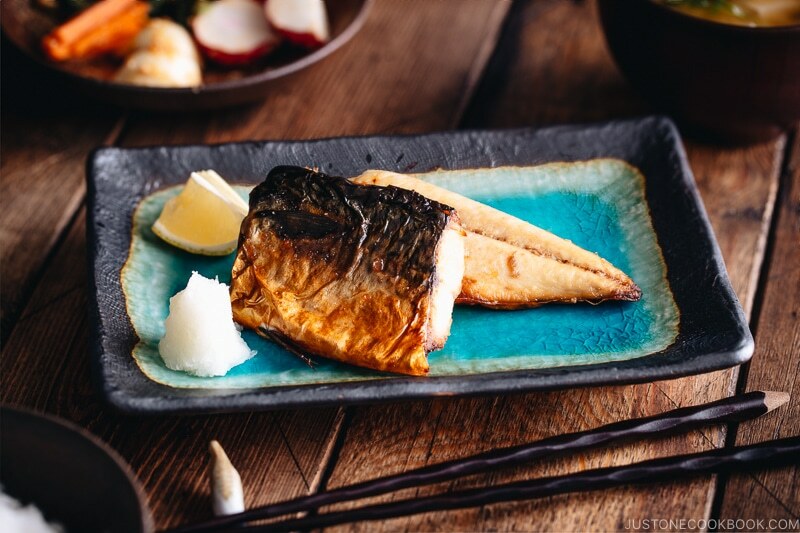 Grilled Mackerel or Saba Shioyaki (鯖の塩焼き) is one of the popular seafood dishes served as an entree or part of a bento combination in Japanese restaurants in the U.S. You may already know this, but what you may not know is how fast and easy it is to make this grilled fish at home. This is the reason I love making this for my family dinner — it feels special, but is so very simple. What does Saba Shioyaki mean? 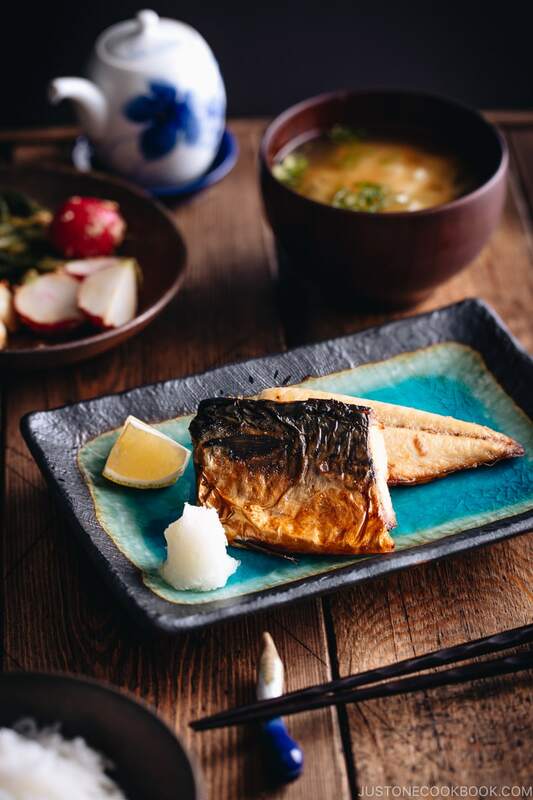 Saba (鯖) is mackerel and Shioyaki (塩焼き) means salt (shio) and grilling (yaki). As you can guess, the only seasoning we need for this dish is salt, which brings out the rich flavors of mackerel. 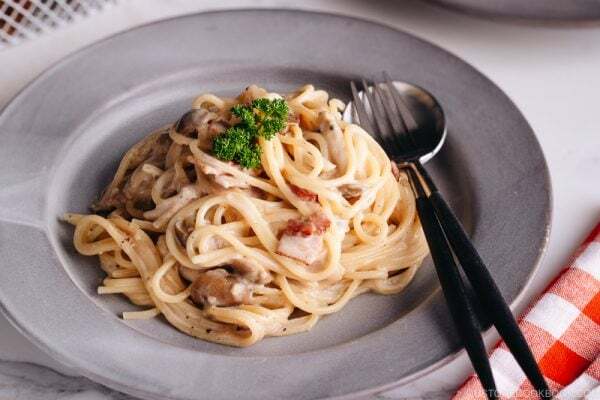 Anyone can just season with salt and cook, and call it a recipe; however, I’ll show you a few tips you can use to make the dish extra delicious! 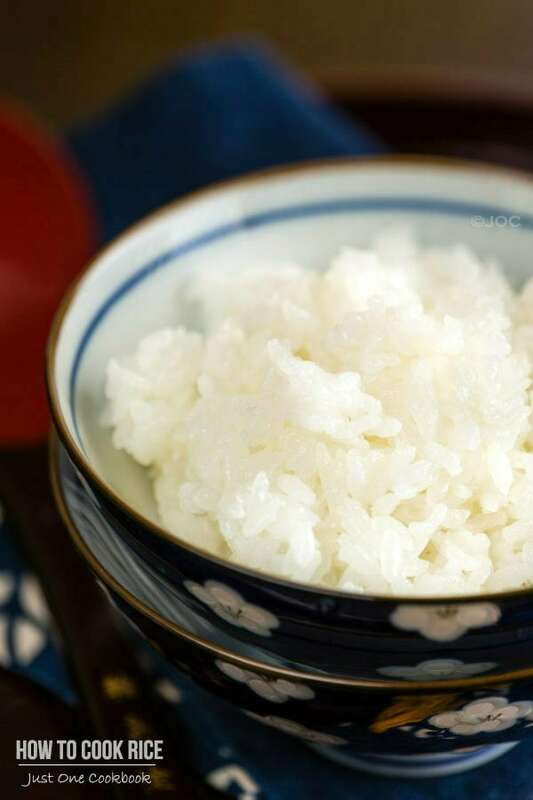 If you’re familiar with Japanese cooking, you’d notice that the majority of recipes call for sake (Japanese rice wine). 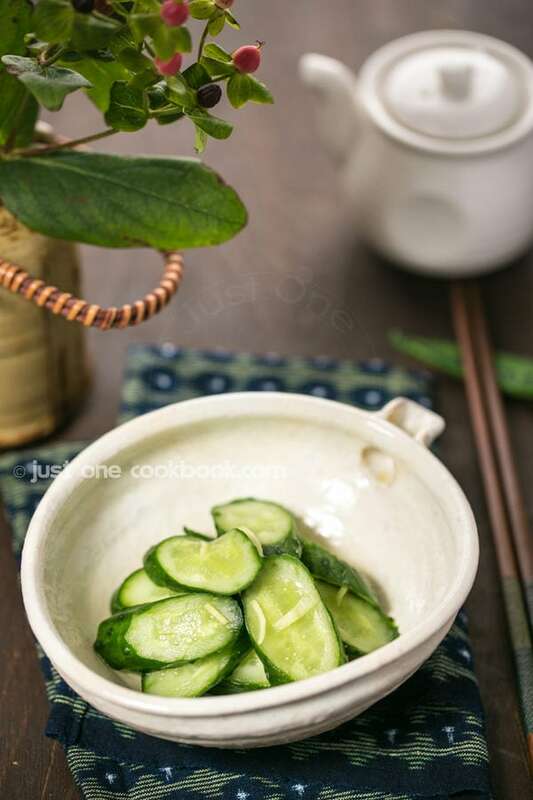 There are many benefits of using sake in Japanese cuisine, and this recipe is no exception. If you are not sure what type of sake you can buy, read this post on my blog. Salt is used not only to season the fish, but it also extracts water from the fish and eliminates any unpleasant smell. Once you sprinkle the mackerel with salt, let it rest for 20 minutes. Do not let it sit anytime shorter or longer. 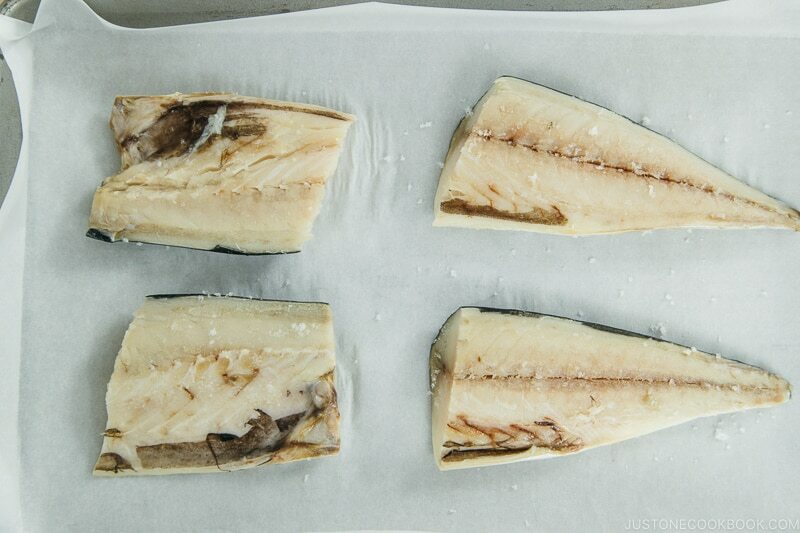 If it is rested too short a time, the fish does not soak up enough salty flavor and the smell may still linger. On the other hand, if you rest it for too long, the smell may be gone but the flesh will get too tight and lose its texture. 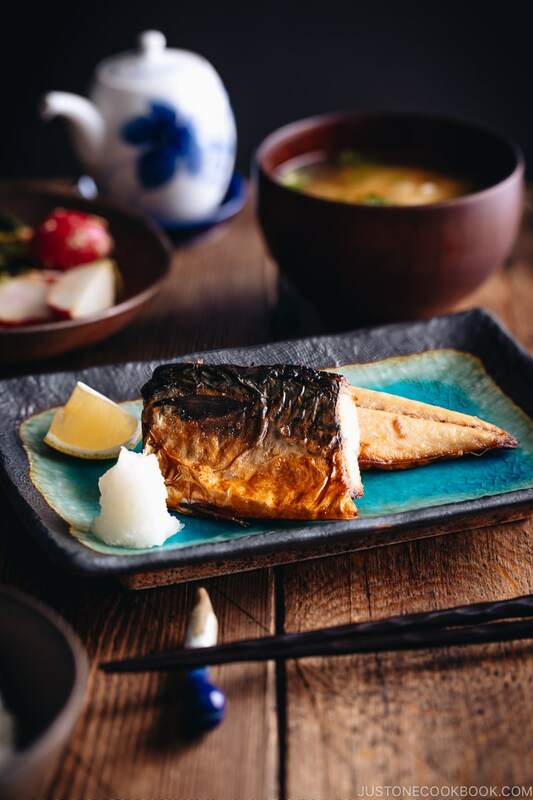 Baked in the oven, this Grilled Mackerel or Saba Shioyaki is the simplest fish recipe you can make on your busy weeknight. 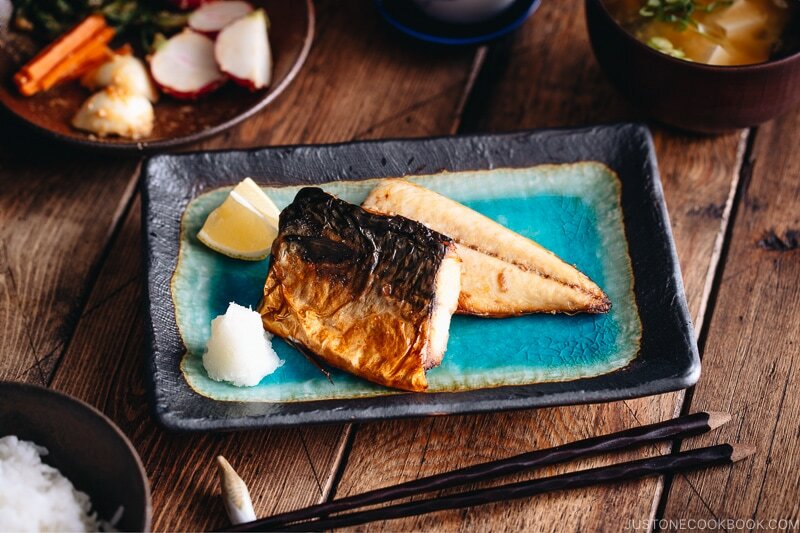 Serve with steamed rice, miso soup, and salad to go with this delicious fish! Editor’s Note: The post was originally published in April 2013. The images and content have been updated in February 2019. Hi Nami! Health is very important… more than anything else. Take good care of yourself and your kids! Grilled Mackerel is what I would always order in a Japanese restaurant. Thanks for sharing this. I always enjoy your fish recipe. This one is amazing. I love grilled mackerel! I always order this when I’m dining at a Japanese restaurant. Thanks for sharing your recipe and I hope you recover soon! Take care. glad you guys are feeling better! wow that looks good Nami. I love smoked mackerel pate, but I haven’t managed to cook fresh mackerel, to my shame. But this recipe has inspired me. So sorry you’ve all been sick. The only thing worse than having sick children is being sick at the same time – what a horror! Hope you are all well again! So sorry to hear you and kids were sick and wish you all get well soon. Like grilled mackerel so much, tasty! Thanks for sharing. Thank you for your kind words Liliana! I really hope to get better soon. It’s not fun to be sick and take care of sick kid… 🙂 Thank you for the well wishes! Glad to hear you’re feeling better! 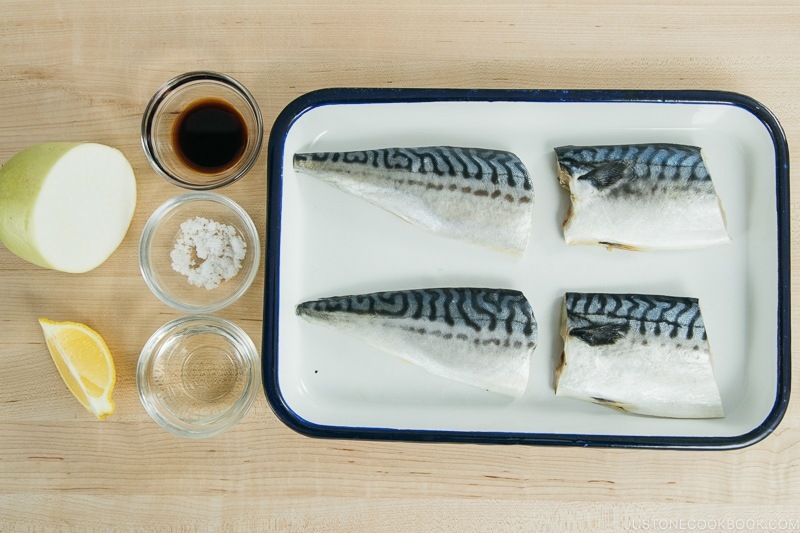 Mackerel is so good for you – this looks so tasty! Hey Nami, please take care of your health, and I hope that you’re already feeling much better. I have never had makereral before and I know I just spelled it wrong but going backwards on my iPhone will lose my post sometimes. I hope you all get to feeling better. How well I remember passing sickness around in my house. Sounds like your hubby is next in line. I hope not. Thanks for sharing this recipe. I know how it is to get sick from what kids bring from school (kinder garden in my case). Hope you are feeling well now. We are still waiting for spring here..hope it will come soon. Love your photos and the recipe sounds amazing. Lovely mackerel pictures…Congrats on Babble’s 100 Mom’s blogs!!!! I’m glad to hear that your family is recovering — stay healthy!! This recipe looks very easy to follow, and I’m looking forward to getting some fish at the local market this weekend. I’ve never had grated daikon before (only boiled in soups and stocks), but it looks like it would be a refreshing pairing with saba. Thanks for sharing with us! This dish looks really good, I love fish and I am looking forward to try it. This is one of my favorite dishes. It’s so fast and easy. Awwww, Nami, I hope you are all doing well!!! My kids have been sick on and off this entire winter… poor babies. If there’s anyone that can make fish look good on a photo, that is only you, my friend. Gorgeous! This is one of my favorites fishes. Love it in sushi too. I finally moved my “kitchen” to a new virtual home, and going crazy with the lasts touches. Aww I hope you all are on the way to recovery! We both get sick almost at the same time and I know how stressful and tiring is to watch sick kids. Sending you and your kids virtual healing hugs! I love mackerel and you did such a great job making it so delicious! I truly love your pictures..they are making me hungry! I love the simplicity of this delicious dish. I hope you and the kids are feeling better now. Have an enjoyable weekend! So sorry you’ve been sick! I hope everyone is feeling better. And congrats on the new sever – that means you’re getting tons of traffic, yes? 🙂 Love this dish – it doesn’t get any easier to make than this! I rarely eat mackerel for some reason – I should have it more often. Really like the idea of serving it with the daikon radish. Good stuff – thanks. Glad to see you back and feeling better. So sorry you and your kids got sick, it’s never easy! But this grilled mackerel is such a healthy dish. We tried something like this in Tokyo and I’ve been meaning to ask you how to do it. This post is perfect and didn’t realize it was so easy. Welcome back and thanks for sharing, Nami! Your mackerel looks so tasty and I love that serving plate. Hope you are all feeling better! I’m happy to see you back Nami but so sorry to hear you and your daughter were sick 🙁 You’ve done so much in the past week! Travel, sickness, AND moving your blog to a new server. I hope things settle down for you soon. I love the simplicity of this fish. It looks wonderful! I hope you all are doing ok now! The season change has been crazy everywhere, my boys are too not well. It’s nice you took a small break, you know how sometime we need it.. BAdly! Anyways gal this fish looks fantastic and that plate LOVE IT! That looks fantastic! Mackerel is such a tasty fish. I love your pretty plate. Sorry to hear about you and the kids. Hope you guys fully recover soon. Take good care. I’ve had grilled Mackerel and it’s delicious. Love that plate of yours. I’m sorry to hear that you and the little ones all got sick but it’s great that you’ve all recovered. Mackerel … not one of my favourite fish due to its very fishy taste but the recipe looks attractive. Thanks for the recipe. My family LOVES grilled saba so I make it whenever I can find it in stores. BUT … there is a serious lack of this fish on the east coast. We rarely get any and if so, it’s frozen in a supermarket! Too bad – a super food! I’m so sorry to hear you and your kids took ill. The season has been fraught with flu. My son is still recovering, his 6th day of fever. Hope everything is back to normal soon. The Mackarel looks tender and flavorful. Thank you for your kind words Minnie! My daughter had a high fever for 3 days too, and my son and I also had fever. I hope your son will recover soon and take good care. I hope that you’re feeling better now! Thanks for this easier recipe, it’s good after a long day at work! I was wondering what kind of sake you use, regular sake, or mirin? I know mirin is generally used for cooking. Hi Rachel! I use Gekkeikan, regular sake. Mirin is sweetened sake, and we use it a lot for Japanese cooking. For this recipe you just need regular sake. I wrote a little bit more about sake here. Hope everyone is feeling well now! This grilled mackerel recipe looks delicious. I love how you break it down and make it seem so easy and do-able for us! This grilled fish looks delicious Nami! I should get a toaster oven. My in-laws have one and when we stayed with them I used to use it all the time during the week for easy dinners. This mackerel looks like one we would all enjoy too. I do hope you’re feeling better quickly. It’s never fun to have sick kids, but even worse when you end up sick yourself. I hope you’re all up and running in no time. Hugs to you all! Great easy fish recipe to follow . 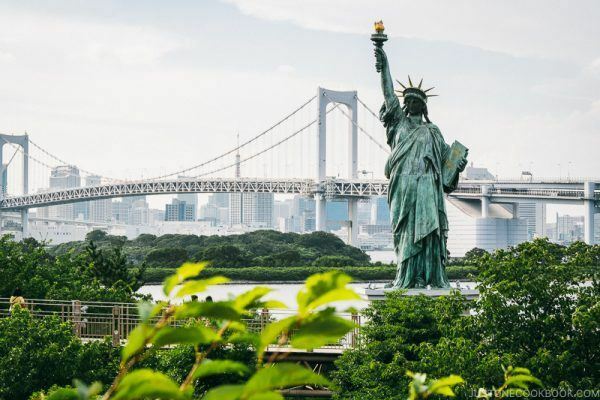 . . Namiko-san: please look after yourself – we will be here when you are fully healthy again 🙂 ! Thank you so much for your kind words Eha. I’m trying my best to recover soon. Thank you again! Hope you and your children are feeling better. The fish looks fantastic and from a toaster oven no less! I love those things. Sorry to hear that your family are not well but I’m glad that everyone is recovering. Tried and tested this is delicious! Thank you again for a great simple recipe. Don’t worry Nami, take your time, always family come first. You know what, we are going to celebrate my son Birthday at a Japanese Yakitori restaurant later tonight, and one of our favourite dish is this grilled Saba, they grill it over charcoal fire, it is super yummy. Anyway, your grilled Saba look equally good! I hope your family is all feeling better now, Nami. Thanks for sharing this. We can easily buy this fish and all I know is to squeeze lemon onto it… now I can try it with your recipe. More gorgeous food but good grief take care of yourselves. You only have one you. We love you. Spring break is a tough time to be sick for you or the kids. I hope you are feeling better my friend! Recover soon! On Nami, I do sincerely hope that you and your family will feel much better very soon! Your dish looks so delicious on that breathtakingly pretty plate that you served this on. Mackerel is actually a fish that can be easily found around here, it is so healthy and delicious but I certainly never enjoyed it the way you prepared it – this recipe sounds fabulous! Wishing you all the speediest of recoveries! I wish you fully recovering very soon, and coming back to your enthusiasm as always . and I do have a question, I can’t consume sake , what should I substitute it with ? Hi Suki! Thank you for your well wishes. I’m hoping to get well soon. This looks delicious! I am glad everyone is feeling better. Having a blog is having a commitment and it needs dedication, but first of all, we are mothers and our kids are the most important thing in the world. Sending good thoughts your way that you are all feeling better, Nami! 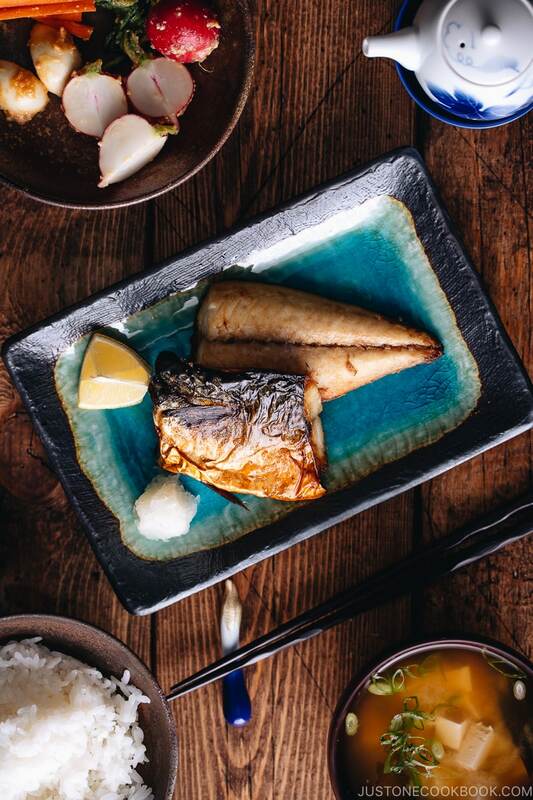 The grilled mackerel is lovely and the photos are gorgeous!!! Have a beautiful Saturday! Oh, I’m so sorry you’ve all been sick, Nami! Hope you’re on the mend. And, again, I’m sorry to hear about your server woes…what a pain. Your mackerel looks fantastic, my friend. Take care!!! Hope you and your kid get well soon. Another mackerel fish recipe , I like it, I will try it since I can buy this type of fish in Malaysia easily. Now i have another new menu for my dinner. I hope I get better soon too. Thank you so much for your well wishes. 🙂 Hope you enjoy this recipe! Nami, I hope you feel a little better now. Even ill, you somehow still manage to post regularly such wonderful dishes! You are incredible! I love the way you treat the mackerel: so simple and yet so delicious. I only prepare mackerel with miso, but now that it’s warmer, grilling seems a much better option. And I like mackerel so much! Take care! it’s simple, easy, ealty and yet tasty! This is one of my favorite fish dishes. So delicious & so easy to prepare. Hope you are getting some quality rest & get well soon, Nami! hope you and your family all recover soon! this is a lovely dish, I bet it is fantastic tasting! I never had viewing your post. sorry to hear you and your daughter were not keeping well for few days. I am glad you both are well now. so sorry to hear that you and your daughter were not feeling well. Hope that you are fully recovered by now. Love the recipe, it’s fresh and light and looks delicious! Nami, I hope you and your kids are feeling better. Sorry everyone was sick during spring break or anytime for that matter. What a great way to cook mackerel. I’ve had mackerel before, and this looks like the tastiest of all the recipes I’ve tasted – and it’s easy! Makes it even better. Thanks for sharing! This is also a very popular fish dish in KL. Hubby likes it. I hope yr daughter is feeling much better and tht u enjoyed your holidays. Love this! Jason’s mom makes this all the time and it’s the best. Although Jason has to be the one to take out the bones – I’m the worst at that! Hi Jim! Thank you for your kind words. I’m slowly recovering! Here are Japanese videos I found how to debone saba. They speak Japanese but I think the image is clear to understand how to do it. By the way, where did you get the plate? It’s very nice. It suits very well with the food served on top. Ah no Nami, hope you and the kids are alright. You are one stellar mum taking care of everyone and dealing with server issues AND giving us this amazing recipe. Best. Hope you are feeling better. The fish looks so fresh and delicious. Perfect way to cook and serve fish. love it. Aww, I’m so sorry to hear about you guys being sick! We just dealt with that this weekend and I’m starting to feel it now too:( But I love a simple grilled fish. Yours looks perfectly cooked! And beautiful photos, as always!!! Nami, hope you all feel better soon- We also eat a lot of Mackerel back in India. This recipe is very new to me. Will definitely try it out. Love the bowl you have used! Nami, this mackerel looks so delicious and so easily prepared! I love that your tutorials for even the simplest dishes are so thorough. Great job, and thank you for sharing! Have a lovely week! I love simple, fresh grilled fish. This looks really lovely. Hope you and your family are feeling well now! This together with sanma are one of so many of my favourite Japanese recipes. I normally grill saba skin side up on a chargrill (heat from top) so the skin is slightly seared and crispy and also any excess moisture will drip off the grill. Is there any reason that you grill it skin side down? Also, I need a squeeze of lemon juice onto the fish once it is ready. Is that a Japanese tradition or simply an addition by some Japanese restaurants? Hi C&MSP! I learned from my mom (and it’s actually common Japanese cooking term) that we have to cook 魚身鳥皮. I assume you can read Chinese, but it means for fish we start cooking from flesh and for chicken we cook from skin. So when I place fish in a fish griller (in Japan we have a special broiler for fish under the stove top), we always face the fish flesh to the heat source first. So I do the same for toaster oven. Another reason is that the flesh tends to stick on aluminum foil. I have oiled the aluminum foil before to see if it helps, but it still sticks (maybe wire rack may help). Saba skin has natural oil like you said and it prevents from sticking when the skin side is down (and I do not put oil at all). The skin gets crispy too but won’t be easily burn when it’s on the bottom. Thanks for the clarification. I always need daikon oroshi with this dish. I read somewhere it is not good to have the food in direct contact with the foil when baking so now I put a sheet of baking paper over the foil before wrapping up the food, eg a spaghetti marinara in the oven to retain all the flavours. If I am pan-searing say a salmon fillet, I would cook that skin-side down on the pan for about 80% of cooking time before flipping over, depending on thickness of the cut. The skin doesn’t burn since it has natural oils and becomes really crispy too. Oops, I sometimes use foil for cooking/grilling/baking! >_< Using baking paper sounds like a good idea! 🙂 Thank you so much for your advice! Oh no, hope you and your kids are completely well now. I usually go by the oven-grill-method when it comes to saba mackerel too. But I don’t buy mackerel often enough. I shd do it more often. These viruses are so awful! And once they enter in the family only God knows who they will hit next! I hope you are all have recovered by now and fish is such a great source of vitamins and elements. The perfect way to strengthen yourselves! Wow Nami, the fish on that beautiful plate looks like a piece of artwork! I’m not super adventuresome when it comes to fish so always love a great but simple new recipe! Yum Nami! This looks soo good! So sorry to hear you and your family are under the weather! I was wondering what happened to you. Speedy recovery to all. Next to salmon, saba is my favorite fish! I love the fattiness and the idea of simply grilling it makes my mouth water! Maybe this will be on our menu tonight! Take care, Nami! I’m so sorry to hear that all of you have been ill – kids always bring everything home from school, don’t they? I hope you are all feeling better by now. I’m not crazy about a lot of kinds of fish, but my husband loves it, so I will bookmark this to try for him! Thanks! Nami, I hope everyone in the family is back to good health. Fish is a great food to fight colds and this is a lovely simple recipe. mackerel has such a pretty design on the skin too. Looks absolutely yummy! Will give this recipe a go! 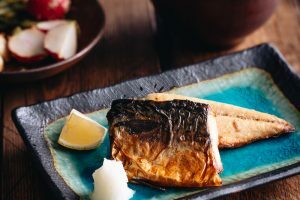 My hubby and I LOVE grilled mackerel at Japanese restaurants, and I am glad that you shared this recipe. The first time I tried making this at home – I had pan fried the fish which made it a bit more oily than I had liked. I will try salting it and baking it the next time. Thanks again for sharing this recipe! And I hope that you and your daughter are now feeling better! Oh I’m so sorry to hear about the sickness! I hope everyone starts to feel better…and soon. This looks delicious. Perfectly grilled. Thank you for sharing! I’m glad to be back home after a week of traveling…and finally catching up on my favorite blogs. I hope you have a blessed week! This is a super quick meal. I’ve been making more fish for my family lately and I know they would like this. So simple, but I bet this tastes so good. I hope you feel better soon. Nami, I am sorry you have been sick and hope you are feeling better very soon. Take good care of yourself. Your grilled mackerel looks fabulous! I love the grated daikon on the side. My husband is a big fan and always orders mackerel in Japanese restaurants. Now I can try it at home! Lovely looking fish – I love mackerel… isn’t the colour and pattern of the skin so pretty? My kids were sick for their Spring Break, too! Well, two out of three, so the healthy one was bored, bored, bored. I’ve been sick with allergies, so I know how everything shuts down when Mommy is sick. Feel better and the blog will always be there! I’m glad you’re all feeling better! Wow, that must have been so tough with everyone getting sick. I think this looks simple and delicious. Mackerel is so nutritious with all those fatty acids and would be perfect to help rebuild strength. I need to experiment with mackerel more. This looks so delish, Nami! Lovely, I love fish. I made a salmon recipe the other day and used a similar dish. They are pretty, aren’t they? ^.^ That is happiness on a plate right there. Some miso soup and rice with some tsukemono and once again I am back having a Japanese breakfast moment. Thanks so much for the post, Nami and we are all hoping your road to recovery is quick! I hope you’re feeling better by now. I have to try your mackerel recipe soon. I am always looking for easy fish recipes. This looks really tasty and easy. I love it! Glad you are all better now. I cook everything, but somehow have never cooked fresh mackerel. With your inspiration, next time I see it at the market, I’m picking it up and bringing it home to use your method. Nami I’m so sorry to hear you were all ill, I hope everyone is healthy now. Your mackerel looks scrumptious. It is one of my favorite fishes to eat and have to give your recipe a try. Hi Nami san, I chance upon this webpage when I’m trying to find the Saba shio receipe. I have tried to cook and the skin always stick to the aluminum foil. Can I check if I can bake the fish with the skin facing up instead of skin facing down? I have tried using oil but the skin got stuck onto the foil as well. Guess I am just bad at cooking. Maybe I should use parchment paper instead. Do you think this is a better choice then aluminum foil? Besides mackerel and salmon what other type of fish is nice when you grill with salt seasoning? Will snapper taste as good? i have a cheap toaster oven that doesn’t have a preheat option, do I still need to preheat it? Any idea how long that would take? I tried broiling once it didn’t come out well (no browning). But I would love to make this in a toaster oven instead of heating up the whole kitchen. Thanks. This looks like a tasty simple dinner. Thanks for publishing this recipe! I will surely try this menu. Hi , thank you for the recipe. May I know why you put the fish skin side down on the baking sheet? I thought if the skin is up, it will keep the fish moist & the skin will be crispy. Hi Nami, I would love to try this recipe but the only mackerels I find at the market are from China. Where can I find mackerels from other countries? Thank you! Hi Ann! Hmmm I haven’t bought mackerels for a while so I didn’t pay attention to the source. Try other supermarket with great seafood selection. And maybe a store that cares about quality and source? Thank you for your prompt reply Nami! I just tried the grilled saba it was delicious! However my fish didn’t have the golden brown skin like yours. Do I neex to flip the fish ? I baked for 25 minutes. I was afraid over baking may cause the fish to turn dry. Nevertheless my family still thoroughly enjoyed it! Hi Minn! Thanks so much for trying this recipe! I use a toaster oven, which heat source is pretty close to the fish compared to the oven. Maybe that’s why? Did you use a toaster oven too? If you use an oven, maybe use “broil” setting and give some distance (not too close so it doesn’t burn). 🙂 Hope this helps! The sake really balances out the fishiness while it’s baking and while your eating it. I will forever dunk mackarel in sake. Thank you very much for this awesome recipe. I know this is an old post but I wanted to say I love this recipe because its so simple, and I eat it all the time because saba is always on sale at my local market! Love it with rice and an ume! Do you keep mackerel in you freezer? If so, how do you thaw and cook it for Saba Shioyaki? Hi Nami, the mackerels I buy are frozen and lightly salted. Do I still salt them? Thanks! Sentimental to read I was there to comment in 2013! Learned a thing or two I still use ) ! Hope you had a super time skiing: loved the IG post . . . I hope you are feeling better! Take care of your health! 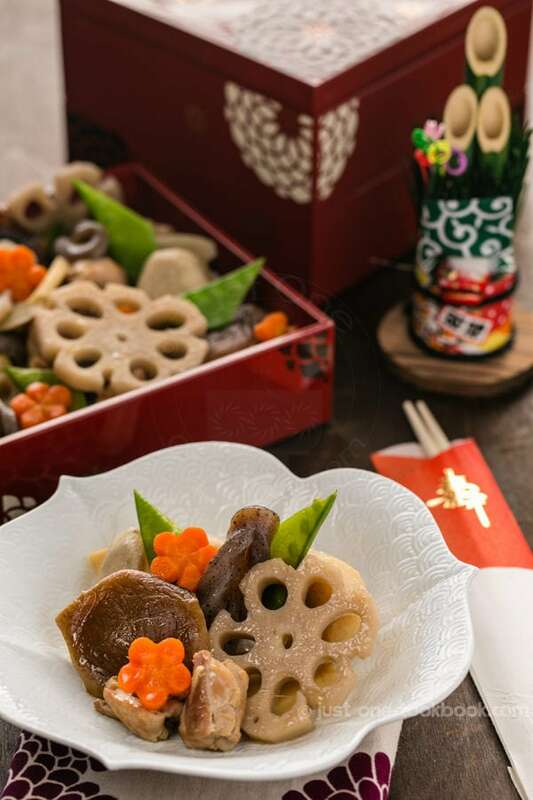 In Japan, are fish dishes usually served with the bones still in the fish or are the bones usually removed during prep time and served boneless? This looks so yummy!!! Hi Emily! Oh, I’m sorry, you probably saw earlier comments from 2013 when this post was originally published. I’m healthy and doing well! Thanks for your kind thoughts.